One of two remaining windmills in Montmartre where once a hill of fields and windmills beguiled Van Gogh and the impressionists. The Montmartre of Van Gogh’s time was a land of fields and windmills. In my ignorant youth I only thought of windmills as a “Dutch thing”, but, as paintings of the area show, Montmartre was covered with them. Now of course it is a different thing and most have vanished into time except for the one I photographed here and another example and of course the pantomime Moulin Rouge. 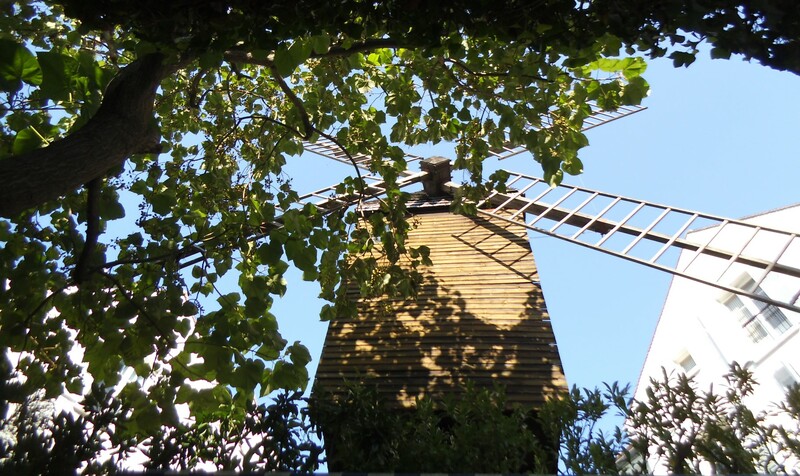 The Moulin la Galette is one of the few remaining windmills in Montmarte. Its sails were off when we visited the first time but they are back now. I did take a group of language students to France a while ago and we showed them the wonders of Montmartre, finishing at the bottom of the hill at the Moulin Rouge. This sad remnant sits grubbily amongst a cluster of underwhelmingly prosaic buildings and we hastily snapped photos and scurried down the Boulevard de Clichy to Blanche Metro Station doing our best to divert the boys’ attention from the blatently unashamed “adult shops” and the “Musee de Erotisisme” that dubiously adorn the street. Unfortunately my cries of “Avert your eyes gentlemen!” and “Oh look! An adorable puppy!” had little effect. There’s something so appealing about windmills–the old ones like you photograph, not the modern practical things that don’t resemble them at all. The ones you’ve shared have a subtle romance that calls to poets. And in addition to my beloved “Vincent”, they always make me think of Don Quixote…another love. So glad you liked the photos. It was great to see it with and without the sails. Wind power before ir was trendy. It is always sad to see a part of the city lose its lustre and have an air of neglect about it. Thanks so much for sharing the wonderful post. She was a fascinating and talented person. Windmills are so beautiful! Thank you for sharing such a great post. Happy Friday my Angel!